How Much Road Salt Ends Up In Lake Michigan? 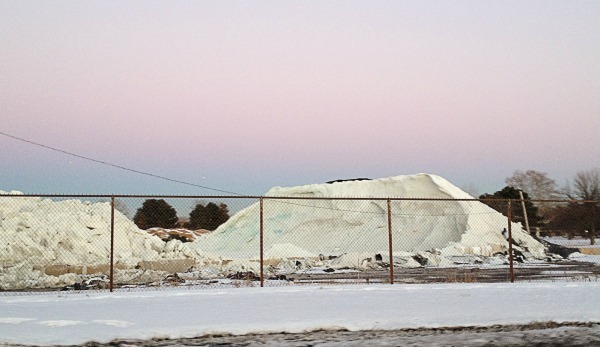 The Chicago salt pile that Oak Parker Aaron Stigger sees on his way to work. How does all the winter salt runoff affect Lake Michigan&apos;s water? But he really piqued our interest after telling us the backstory. The particular mound of salt that Aaron saw is in Dunning, a neighborhood on the city’s Northwest Side. That mound&apos;s got company: Chicago stores 19 piles of salt across the city. And that’s not counting many more spread across the suburbs and Northwest Indiana. But is there really a wall of brine heading to the lake and, if so, should we be worried? We found out that, at least according to a few environmental standards, Lake Michigan is actually in much better shape than Stigger expected. But another waterway may have earned his concern. Just how much salt are we talking about, anyway? Before we get to specifics on any effects on Lake Michigan, let’s put the amounts of road salt we use into perspective, at least when it comes to Chicago. That’s counting this winter, which has been particularly brutal. As of February 28, the city already dumped more than 370,000 tons of salt on city streets — a solid 42 percent more than the next heaviest use in the previous five years. It’s not just a problem in Chicago. Humans move a lot of salt. A 2004 study estimated that we mobilize more than 140 teragrams — that’s 140 billion kilograms — of chlorides every year. Video: Just how big are these salt piles? So, with some of these figures in mind, let’s consider the effects. Aaron Stigger’s “aha moment” came about when he saw one of the city’s salt piles while it was uncovered. It’s a reasonable concern, given that researchers from the University of Rhode Island estimate uncovered salt piles lost about 20 percent of their salt each year. Much of it ends up in nearby waterways. But where’s this runoff headed? The hydrological lay of the land is such that most salt-laden runoff in Chicago ends up in the Chicago River and other inland waterways — not Lake Michigan. The principal reason is that the city reversed the flow of the river more than 100 years ago, so most of our runoff ends up in the waterways that feed into the Illinois River, which flows into the Mississippi and eventually the Gulf of Mexico. A 2010 study from the University of Illinois at Urbana-Champaign found road salt runoff and treated wastewater from the Chicago region are the dominant sources of chlorides in the navigable sections of the Illinois River, and two major tributaries in the Chicago region. The study says that number has risen steadily since about 1960. In high concentrations, chlorides can be toxic to aquatic life. But it’s hard to tell how many times salt runoff from Chicago has caused toxic levels of chlorides in inland waterways, because the Illinois Pollution Control Board doesn’t classify those waters as “General Use” waterways. Those waters are subject to Illinois’ 500 mg/L water quality standard. Instead, IEPA regulates “total dissolved solids” in Chicago-area waterways, lumping together chlorides, sulfates and other chemicals for a single reading. Chloride levels have spiked above 1000 mg/L in some inland waterways — twice IEPA’s standard for most of the state. But those waters are much cleaner now. The Metropolitan Water Reclamation District of Greater Chicago, which handles and treats the region’s combined runoff and sewer water, has improved its filtration methods. MWRD Spokeswoman Allison Fore says they’ve adopted best practices suggested by the DuPage/Salt Creek Work Group for managing their roadways and facilities. Regulators would come up with some kind of limit for chloride in Chicago-area rivers. That could make cities think twice before spreading so much road salt. It’s much tougher for the EPA to regulate salt from so many spread-out sources (storm drains spread out across the city and suburbs) than from, say, a factory with a fallout pipe dumping salt into the river. So our question asker Aaron Stigger is right to worry about salt runoff, but not so much in Lake Michigan. In Chicago’s case, it’s our inland waterways that are in trouble. Before it even gets into area waterways, salt works its way through the city’s subterranean network of pipes. That can cause problems for the city’s Department of Water Management, which provides drinking water to Chicago and 125 suburbs. They also deliver stormwater to MWRD for treatment. Tom Powers, the city’s commissioner of water management, says chlorides are at such a low concentration in Lake Michigan that his department barely takes note. 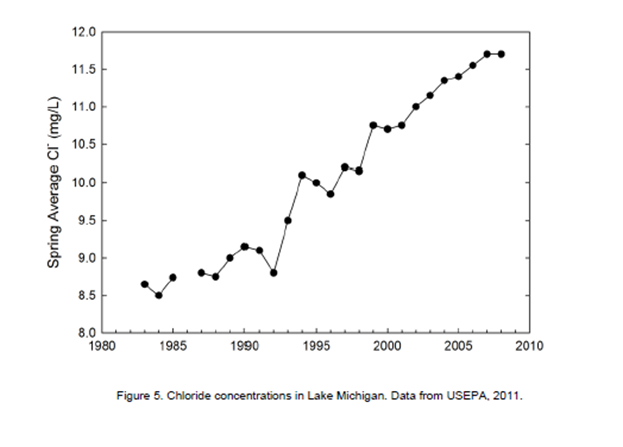 The EPA’s national drinking water standard for chloride is 250 mg/L, some 20 times higher than Lake Michigan’s current concentration. Chicago’s Dept. of Water Management, like many such agencies, adds water softeners that can include salt. But it’s not enough to even approach the EPA limits. But road salt can corrode the pipes that carry that water, exacerbating the stress that the winter freeze-and-thaw cycle puts on an aging network of water pipes that would stretch 4,500 miles if laid end to end. About 1,000 miles of those water pipes are 100 years old or older, Powers says. In 2009 the department had to repair 8,873 catch basins — more than twice last year’s 3,647. Development in urban areas makes the salt corrosion problem worse, by funneling more runoff into the system. Studies have correlated growth in chloride levels with the rate of urbanization, and even with miles of road in the vicinity of the waterway in question. So more development, more impervious surfaces, more runoff. So not much of that salt ends up in Lake Michigan. But there is enough runoff to register an increase in Lake Michigan’s chloride levels since Chicago first started spreading road salt. Kim Biggs, a spokeswoman for the Illinois Environmental Protection Agency, says the current chloride levels in Lake Michigan are around 12 milligrams per liter. High chloride levels choke aquatic species that depend on a certain salinity to keep their bodies in equilibrium. Amphibians, like salamanders and frogs, are especially susceptible to chloride pollution. Many of them breed in temporary vernal pools that are cut off from other bodies water, and thus have no way to flush out excess salt. Winter deicing is the major driver of high chloride levels in Chicago’s waterways, but wastewater treatment also contributes. In the outfall of waste water treatment plants in DuPage County, for example, chloride levels are more than ten times higher than they are in Lake Michigan. Studies by the Illinois State Water Survey and MWRD sampled the water flowing out from MWRD’s Stickney wastewater treatment (the largest such plant in the U.S.), and found median chloride levels of 145 mg/L, compared to 8-12 mg/L in Lake Michigan. Most of MWRD’s contribution comes from human waste itself, which contains chlorides. They also use ferric chloride to help filter wastewater — the chemical is useful for, among other eyebrow-raising processes, “sludge thickening” — but are moving away from that in favor of biologically-based techniques that would replace ferric chloride. So what’s the city doing to cut back on its salt use? Dept. of Streets & Sanitation spokeswoman Molly Poppe says they train salt truck drivers to spread salt judiciously — that means waiting until plows have cleared most standing snow, since salt sprinkled on top of several inches of the white stuff won’t do much. When the forecast calls for mild temperatures, salt trucks take it easy and let the weather do some of the work. The city even enlists an unusual fruit cocktail of sorts to get more out of its salt: beet juice. It’s full of sugar, and helps lowers the freezing point of ice. Mixing salt with molasses or another sugary substance can do the same thing. Salt solutions are good too, because they spread out easier than rock salt so they’re more efficient. Wisconsin has started spraying cheese brine for similar reasons. Typical salt (sodium chloride) is not effective in subzero temperatures, but other salt compounds can break ice crystals at lower temperatures — calcium chloride and magnesium chloride are common substitutes, but they eat into concrete and metal faster than table salt. Right now the city uses sodium chloride. So Aaron Stigger’s salt pile is probably going to exist as long as severe winter weather visits Chicago. But if IEPA ups the standard for the metropolitan area’s inland waterways, he might start to see the salt disappear a little bit more gradually. 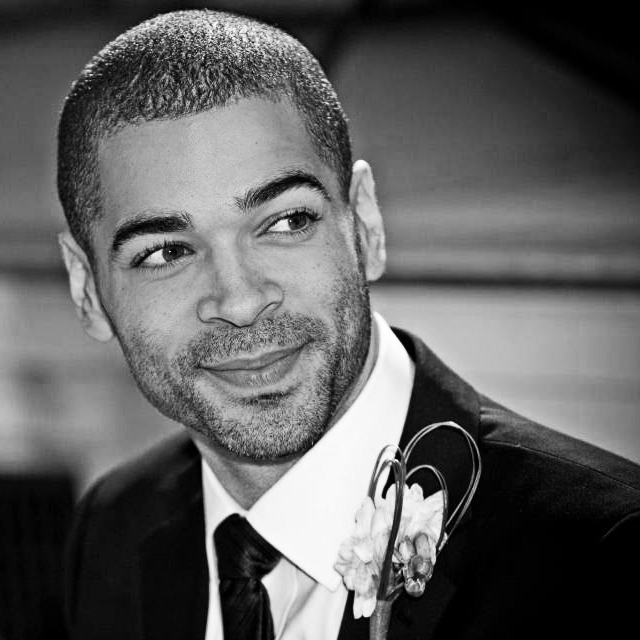 Chris Bentley is a reporter for WBEZ’s Curious City and a freelance journalist. Follow him on Twitter at @Cementley.